The NT539 temperature controller is designed for dry and cast resin transformers with more than 3 windings, commonly used for plant level DC/AC transformers, however it may also be used to monitor the temperature of medium and low voltage three phase transformers. 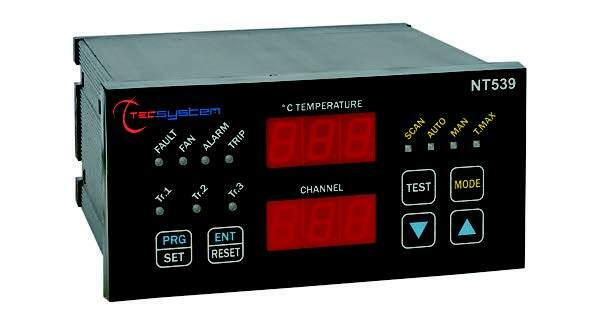 The NT539 is microprocessor based with 9 PT100 inputs and 3 relays for ALARM, 3 relays for TRIP, and 3 for the FAN cooling system. Additionally it comes with a self monitoring circuit and output that will signal if it detects a sensor fault or other internal problem on the PC board. On request a protective coating can be applied to the electronics board for tropical climates.